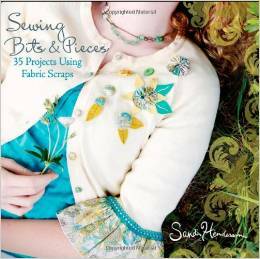 35 projects to turn your favorite fabric scraps into well-loved treasures Sewing with scraps is an economical way to make the most of your designer fabrics-as well as a fun way to use up a stash of your favorite leftovers for smaller projects. Michael Miller fabric designer Sandi Henderson holds to the adage waste not, want not to deliver a collection of innovative sewing projects that lets you make the most of bits and pieces of your beloved fabrics. From a market skirt to a butterfly pin, from an embellished table cloth to hip hair accessories, Sewing Bits and Pieces gives you 35 sewing projects to make unique pieces that are perfect for gift-giving (or keeping for yourself)! Features gorgeous full-color photography throughout Detailed instructions walk you through each project Sandi's popular Portabello Pixie blog is read by thousands every day Packed with tons of fun, innovative projects, Sewing Bits and Pieces will have you creating sewing masterpieces in no time. Note: CD-ROM/DVD and other supplementary materials are not included as part of eBook file.